One of the key steps to making adventure possible is creating a solid financial plan that will let you safely and responsibly exit the workforce and embark on adventure. We addressed debt in the previous article of this series. Now, we need to get a solid handle on current household expenses. The information about our current spending habits will then help us create an adventure travel budget and save money before travel. To demonstrate how one can analyze their household expenses and then build an adventure travel budget and savings plan, through the next few articles, I am going to walk you through an analysis of our household expenses, budget and savings plan for our one year RV adventure. When we were in the planning stages of our adventure, we needed to take a closer look at how we were spending our money as a family of four living and working in the city of Raleigh, NC. The following graph summarizes our household spending habits from April 2012 to September 2015, a nearly 3.5 year period prior to our departure. My wife and I both worked full time during this 3.5 year period. We made some significant advancements in our careers and income during this time, but we also increased our average monthly spending more than 2x in three years. From April to September of 2012, our average monthly spend was $6,821. During the same period in 2015, we spent $15,401 per month on average. It’s relevant to know that a few major events, such as having two children, moving to a larger house, buying two rental properties, and ramping up our savings, were the major contributors to increased spending. About 40% of the average increase in spending is attributed to our acquisition of two rental properties and a new, much bigger primary home, all of which carried monthly mortgage payments and costs. Investments account for about 20% of the increased average spending, as we started socking away money for more real estate, college funds, and the adventure. We started to contribute $1,500 per month to stock investments as part of our real estate investing strategy. We started putting $250 per month into college funds. And, we started building cash savings for our adventure travel kitty. It’s also important to note that I excluded some major purchases during this time because they skewed the results. I excluded from the table the 20% down payments and closing costs for the three houses purchased during this time. I also excluded a large tax bill in 2013 as a result of a Roth IRA conversion and two major home remodeling projects in 2014 and 2015. However, in addition to the kids, houses, and investments, a general increase in our consumer spending attributed to most of the remaining increase in average spending. On average, we spent more on groceries, restaurants, and bills as time passed. We also had an increase in general shopping expenses. We bought furniture to fill our bigger house. Couches, chairs, and beds are expensive. I bought lots of nifty power tools for home improvements and property management. And, wow, little babies seem to “require” a lot of clothes, toys, and other swag, not to mention the doctor visits, speciality foods, and diapers. We did not make any car, boat, or other major, depreciating purchases during this time. We also did not have any car payments or loan payments aside from mortgages. Over the 3.5 years, I did not pay really close attention to our spending. We did not have a budget, but we considered carefully our larger purchases. At the end of each month, I was mainly concerned that we had more money at the end of the month than we did when we started the month. Aside from that, we naturally lived beneath our means. I see, in hindsight, that a budget would have helped us better manage expenses and save more money. We will be living by a budget on our family’s adventure travels, and in the next article I’ll show you how we created our adventure travel budget. Before jumping into budgeting, let’s take a more granular look at our household spending during the six months from April 2015 to September 2015, just before our spending changed as we bought our travel trailer, gear, and other equipment for our RV trip across America. Our household spent quite consistently each month prior to the adventure. Based on an average of the most recent six months, we spent $15,401 per month on average. At the low end, we spent $14,268 in September. 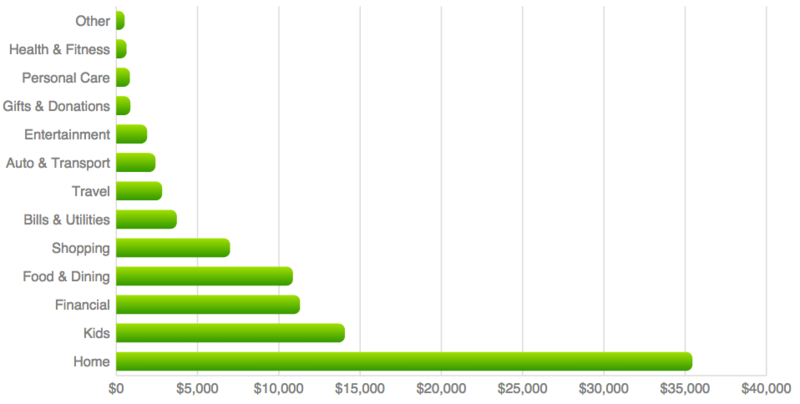 At the high end, we spent $16,492 in April. 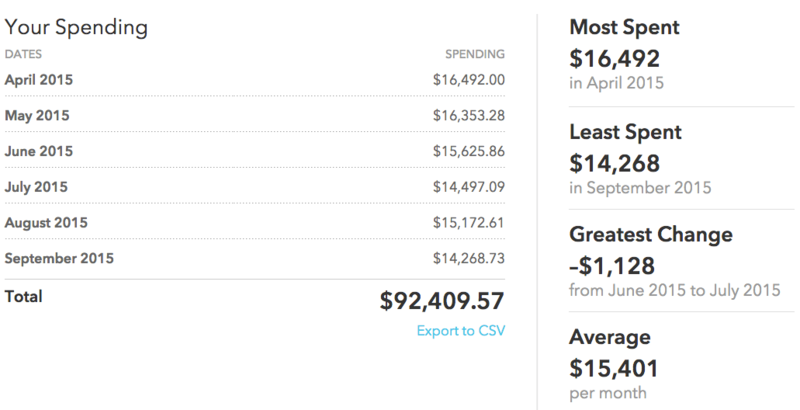 Below is a break down of our monthly expenses over a six month period. For the same period of April to September 2015, let’s break down expenses by categories instead of over time. When we assess the total spending over six months, we see that the greatest expenses are home, kids, and financial. The home category includes home and rental house mortgages and money spent at Lowe’s for home improvement products. The Kids category is primarily composed of child care. Financial is largely comprised of our mutual fund savings contributions and college savings. Food and Dining and Shopping round out the top five. These categories include groceries, restaurants, coffee shops, clothing, toys, and other household items from places like Target and Amazon.com. The other categories are pretty self-explanatory, with the clarification that fuel is in the Auto & Transport category, since this category is going to skyrocket as we haul a trailer around America for a year. Nothing unusual really jumps out about our spending by category. I expect home expenses to be the largest bucket and child care to be a large bucket as well. I suppose I have some disappointment that food and dining is fourth, because I knew I should have carried my lunch to work instead of eat out a couple times per week. We also dined out for dinner at least one night per week, and we (I) also drank a fair amount of beer and wine, which gets expensive. With this understanding of our household expenses prior to traveling, we have solid data to help us accurately estimate our monthly budget while traveling. In the next article, we are going to create our adventure travel monthly budget.